As with many parties, this one started with meeting Erin the year before and having a short talk. During that brief time, it quickly became clear that there was chemistry with Erin and that she would be perfect for a party using the classic 1960’s Batgirl costume. The costume worn by Yvonne Craig in the Adam West and Burt Ward Batman series. As I left Sheri’s ranch last year a number of the ladies were saying bye as I crossed the threshold of the doorway. I recognized one voice above the others and turning, set eyes directly on Erin, gave a final smile and wave, and left knowing I would be contacting Erin with idea. A few weeks had passed before I decided to e-mail her and ask how she would feel about a party in the Batgirl costume mentioned above and her response was totally into it. As plans for my trip would come closer and closer I would e-mail her every now and then to set a little more of the idea in motion. As I was closing in on the dates for the trip, I e-mailed her to confirm the dates Sheri’s had posted as her available dates only to find out Sheri’s website had them wrong and she was trying to have that corrected. Well, having dodged that bullet and finding out what her correct dates were, I set up the flight and hotel reservations. Just prior to the trip I added a little something from her Amazon wish list. I was staying in the hotel when I received news that it had snowed over the mountain pass, summit to Pahrump and that Nevada State Route 160 between Vegas and Sheri’s had been closed. This was the day that Erin was to check into Sheri’s so that she would clear the next day to be available for parties. I received word that she wasn’t able to make in and that she was very apologetic, that she didn’t want to hold me back from a party and I should pick someone else, however, if I could wait, she would be in the next day and available the day after that. This is where I was so happy that I had planned to stay another 2 days before ending my vacation. So I sent word back hoping it would make it to Erin that a 1 day delay was not an issue and we were still good to go for the party a day later. I woke the morning that Erin was to clear and went to the office to ask about her. It would be another two hours before she was officially cleared. About two hours later I walked out of my hotel room and was meandering around the courtyard between the hotel and bar near the pool. Erin must have been looking for me as she emerged from doors near the bar area, smiling from ear to ear, and asked if we wanted to negotiate for a little later in the day as she was now cleared but her room wasn’t quite made yet. It sounded like the perfect idea and so we went to her room and she let the office know she had a gentleman in her room. As we sat on the couch and made a little conversation Erin asked what I was looking for in a party. At this point it only took about half a dozen sentences to explain and meet on a price that worked for both of us. Part of the reason for this ease was that this wasn’t the 1st party of my trip and due to the prior negotiations I was able to quickly let Erin know what I was looking to do and comfortable she would pick up what I was conveying. We set the time for a little later that day giving her a chance to finish her room and giving us both a chance to get ready. Making my way, dressed as Riddler, from the hotel room to the bar only minutes before our agreed time, I thought I was sneaking into the bar only to find Erin was already there dressed in the 1960s Batgirl costume at the other end of the sports bar hovering about. Darn it, foiled again, just how do these Gotham heroes always know where and when we villains are going to show up? I had not mentioned my intention to dress as Riddler for the party and quickly received compliments from Erin, Chanda the Bartender, and a few others. Erin was definitely fan-girling and I loved it! We made our way to her room to grab her things for the party before whisking away to the 60s Bungalow, which only seemed appropriate for this party. Erin made some music selections, we settled in, and played around both in and out of costumes. The party ended with some very nice conversation. When it was over the Riddler was totally driven bat-crazy and was positive that Sheri’s Ranch would not see the last of Erin as the classic 60s Batgirl. It would seem there will be reason for her to get more experiences out of that outfit! 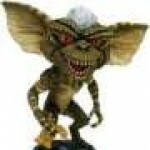 stripe, another impressive role playing party! 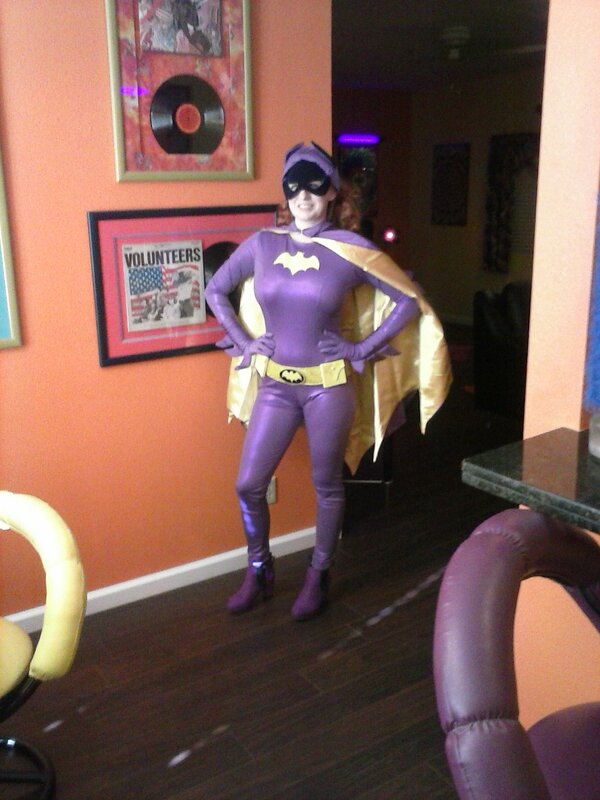 Just been approved to add this photo of Erin as Classic 1960s Batgirl to this post. Enjoy! Oddly just noticed that the chairs in the 60s bungalow match the colors of the costume. how appropriate, stripe. Really must party with Erin, in or out of costume.